Today's post is not about scumbag Carol Kuhnke. No, no, no, because --who knows-- maybe that Oxycodone felon happens to visit One Club Of Justicides today with her bottle of antidepressants being inadvertently empty. 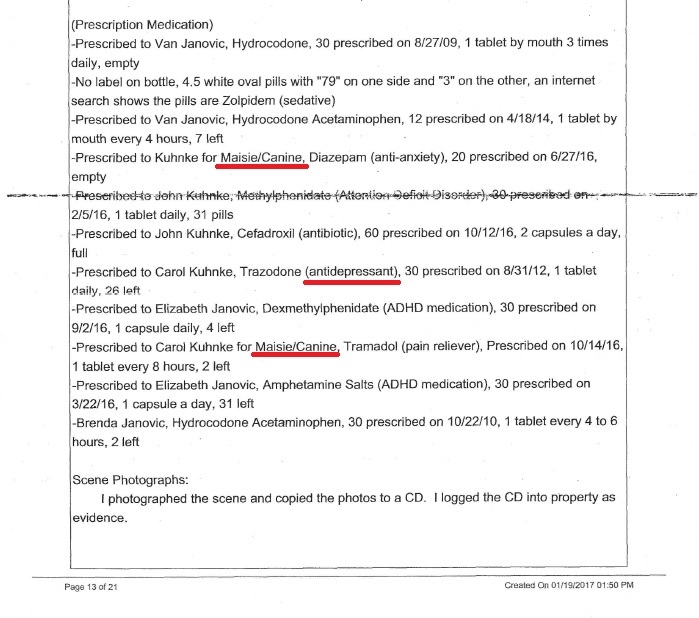 So this time I am giving joyful Oxy-Carol a break (I'm not suggesting that this judge consumed Oxycodone at all, but she was caught stashing it) and therefore will not make references to her ... or only tangentially. Today's post is about a moron and an oxymoron. The moron is Al Pacha, the crooked IT intermediary who fraudulently defamed me at the University of Michigan for the sake of corruptly prolonging his business there. The oxymoron is his current involvement with QCheque, a company dedicated to the prevention of financial fraud. Al Pacha reportedly holds the position of chief technology officer at QCheque, although a more suitable title for him is that of chief defamation officer. Benzinga.com recently featured a panel at the Detroit Fintech Association with Al Pacha as panelist. In the comments section of that article, I sought confirmation of whether or not panelist Pacha is the same intermediary who operates ALPAC, Inc. Apparently the moderator rejected my inquiry, thereby reinforcing my conjecture that we are indeed talking about the one and same Al Pacha. In line with my quest for confirmation, here and by email I urge QCheque to either (1) persuasively clarify if its employee Al Pacha is someone other than Al-Azhar F. Pacha from ALPAC, Inc., or (2) assess whether it is "socially responsible" for an anti-fraud company to employ a person who has a history of making fraudulent representations. He is a liability in any business where being honorable and reputable is crucial. what can we do to make these young kids become college grads and not leave Michigan to go to Silicon Valley? What can we do to keep them here? With this, Al Pacha opened a can of worms to his own detriment. It's time to expose this charlatan. College grads and professionals dislike the abusive clauses a parasitic intermediary imposes on them. Al Pacha has taken it further to the extent of literally violating Michigan legislation. 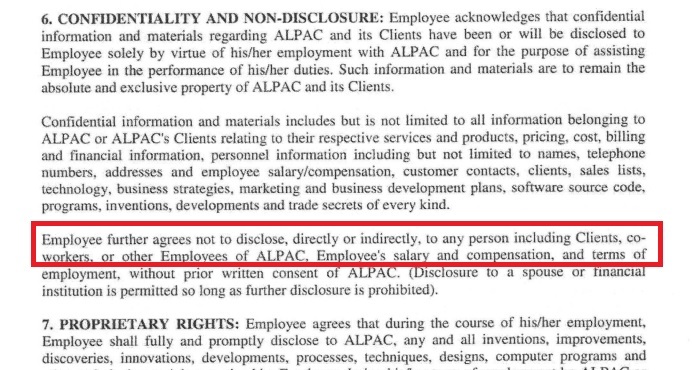 An example of that is his unlawful clause that prohibited me to disclose "to any person including Clients, co-workers, or other Employees of ALPAC" my salary. The intermediary's motive to prohibit his employee a disclosure of that employee's wages is obvious: A client would feel stupid upon learning that roughly (or over) a half of its invoiced amount goes to the intermediary's pocket for essentially nothing, and that only the remainder goes to the professional who performed the work on the intermediary's behalf. The intermediary resorts to this type of illegal prohibitions in an attempt to conceal from the client how underpaid the actual worker is. 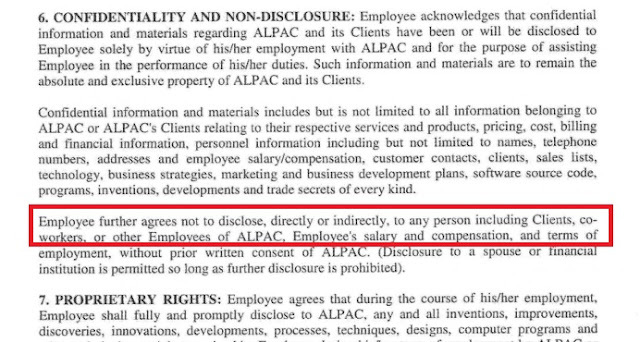 As an IT professional and with no background in law at that time, it took me five years to notice the illegality of Pacha's clause #6 in the Employment Agreement he required me to sign. 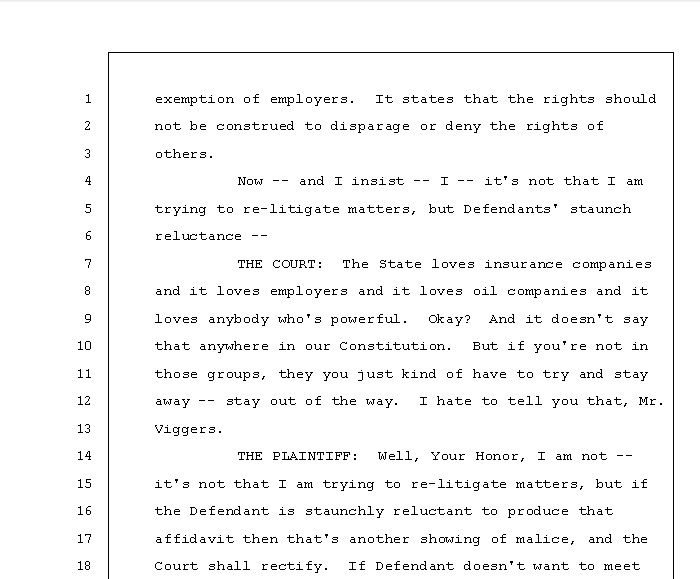 By contrast, the legalese palpable therein makes it not credible that neither crooked Pacha nor his Michigan employment lawyer were aware of the Michigan statute that specifically outlaws an employer's prohibition of that disclosure by the employee. It rather seems as if Pacha and lawyers slide(d) that type of clauses with the hope that "these young kids become college grads" and never realize of Al Pacha's violation of the law. The vision about "keeping the young minds in Michigan" is out of reach when deceitful "businessmen" like Al Pacha indulge in unlawful practices. Disclaimer: Al Pacha did not participate in this recording. Any resemblance between Al Pacha and comedy character El Pachá is just a coincidence. Apropos of QCheque anti-fraud business, this is a good occasion to recap some instances of Al Pacha's fraud. The facts underlying my litigation against Al Pacha are best briefed in my Application for Leave to Appeal in the Michigan Supreme Court and in my Petition for Writ of Certiorari in the SCOTUS, both available here (see items dated September 18, 2017, and May 14, 2018, respectively). For a presentation in video format, see "Corrupted from Ed to Judge" in Youtube channel One Club of Justicides. Fraud may also be committed by suppressing facts — silent fraud — where circumstances establish a legal duty to make full disclosure. Id., citing Hord v. Environmental Research Institute of Michigan (After Remand), 463 Mich. 399, 412, 617 N.W.2d 543 (2000). Such a duty of full disclosure may arise when a party has expressed to another some particularized concern or made a direct inquiry. 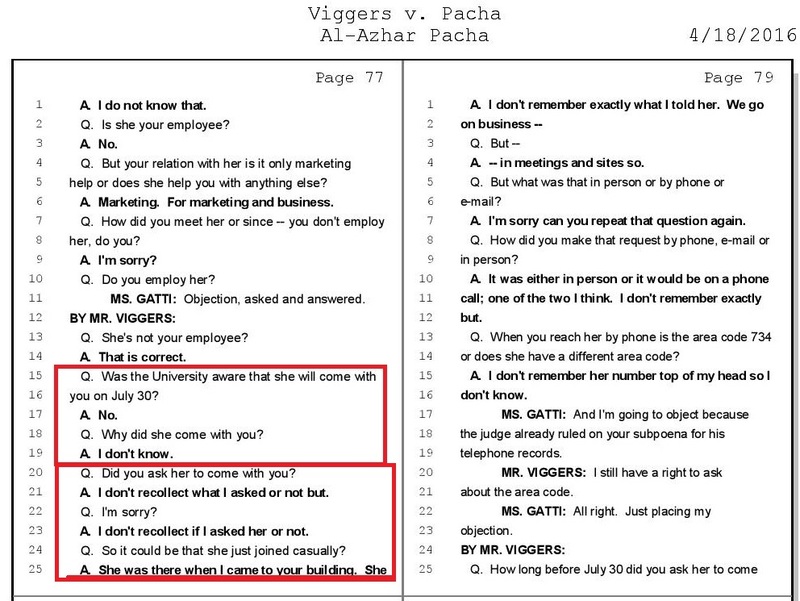 Prior to discovering Pacha's false and defamatory statements, my evidence indicated that the only person defaming me in my workplace was my father's 2nd wife. I subpoenaed the University of Michigan shortly after I filed a lawsuit against her. Then on October 21, 2015, I made Al Pacha the direct and particularized inquiry that is reproduced on page 2 of Exhibit C in my complaint pleadings: to give me a copy of "any feedback/requests/notices from the client (the University of Michigan)" (emphasis in original). The audience will notice that that specific item --and only that item-- is underlined in my specific request. The evident incompleteness and inconclusiveness of Pacha's response prompted me to insist on the item that I underlined in that initial request (page 1 of same Exhibit). Pacha ignored that second email for an obvious reason: He calculated that disclosing to me the University's notifications regarding their deplorable dealings would ultimately unearth Al Pacha's acts of defamation. After months of tortiously covering up Al Pacha, the University realized that its concealment of various subpoenaed records was increasingly evident and unsustainable. That state of affairs prompted the University to finally disclose an email from Al Pacha, in which he used scandalous and alarming language to make fraudulent statements about me (pages 1-2 of Exhibit A in the complaint pleadings). In terms of the definition given in the Bank of Am. case, the situation was that Al Pacha suppressed facts despite his legal duty to make a full disclosure pursuant to my direct and particularized inquiry: Al Pacha incurred what in Michigan's top court is known as silent fraud. Ever since he got busted, Al Pacha has clinged to the pretext that he felt "threatened" by the proverb I wrote in two emails three weeks earlier (interestingly, he made no allusions to the proverb when he told the University the false and intricate narrative he fabricated). Felon Kuhnke obstructed justice by allowing Al Pacha to elude his deposition for entire months. That afforded him the opportunity to purport amnesia while under oath. [I] [e]xplain it to a kid at the age that the kid can understand and comprehend that phrase. Right now I don't have a kid here so I don't know. You are not a kid. How would you feel about a shameless intermediary who for years lived off of your work, then harmed you by fabricating fraudulent narratives, and thereafter comes up with these attempts to elude testimony? For the morbid sake of impressing on the University a false sense of alarm, Al Pacha made a circus by bringing a "witness" with him the day he terminated me. 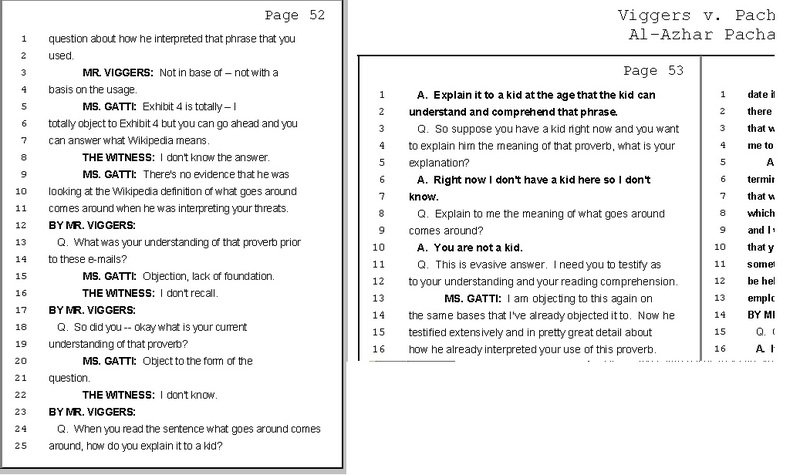 But at deposition Al Pacha's answer to why he brought the witness was his usual "I don't know". The deposition transcript reflects that Al Pacha purported to forget even whether or not he asked his witness to come with him. But Pacha's attempt to malinger amnesia on this matter crumbled few questions later, when he had no option but to admit that he actually requested her to come with him. Major premise: No truthful, honest person would try to elude testimony by malingering amnesia. 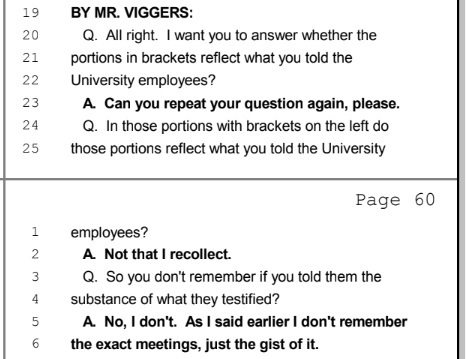 Minor premise: Pages 77-78 of transcript reflect Al Pacha's blatantly malingering of amnesia in his attempt to elude testimony. Conclusion: Al Pacha is not a truthful, honest person. A crucial aspect of Al Pacha's baseness centers on the detailed and fraudulent narrative he fabricated to the University the morning after his defamatory email. His oral and detailed narrative to the University (falsely imputing to me the threat that I "would influence the University against him once I start my employment at the University") is objectively verifiable as false. 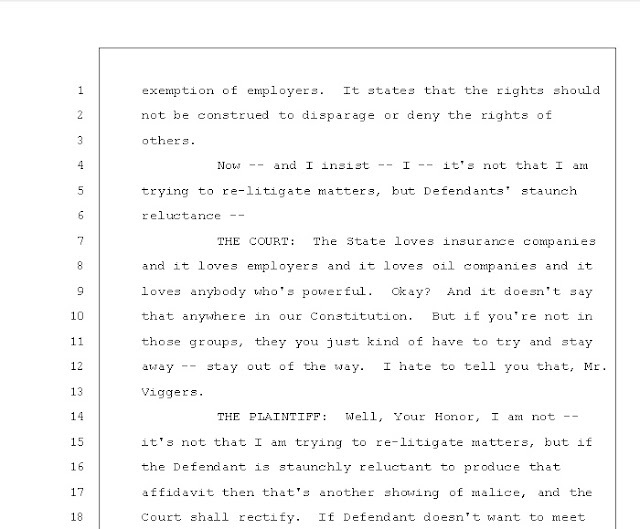 Anyone can corroborate by reading the emails I sent to him (Exhibit A of the complaint pleadings). The three employees of the University who testified under oath gave a strikingly similar version of what Al Pacha told them in person. By contrast, Al Pacha's sworn testimony as to whether he gave that narrative was "Not that I recollect". To this date, Al Pacha refuses my requests that he retract his false and defamatory statements. Al Pacha unreasonably refuses to even produce a reasonably drafted affidavit that is in line with the evidence in court and especially with his sworn testimony: namely, that he does not recollect making the detailed statements that the employees of the University unanimously attributed to him. Had Al Pacha a minimum sense of transparency and integrity, he would have eagerly demarcated himself from that deplorable narrative that reveals him as a liar and a coward. Al Pacha's glaring, persistent dishonesty is at odds with his involvement in the anti-fraud business. "Michigan [...] loves employers and it loves anybody who's powerful. [...] But if you're not in those groups, they [sic] you just have to [...] stay out of the way." The courts at all times entertained the inconsistent and frivolous allegations Al Pacha's lawyers interposed against the long overdue retraction affidavit I have been demanding. But the judges' blatant disregard of the truth does not make Al Pacha an "honest" person. That extent of debauchery of courts and of crooked "businessmen" is not going help Michigan retain talent. People gets justifiably angry with news such as TSA hiring of thieves and pedophiles. 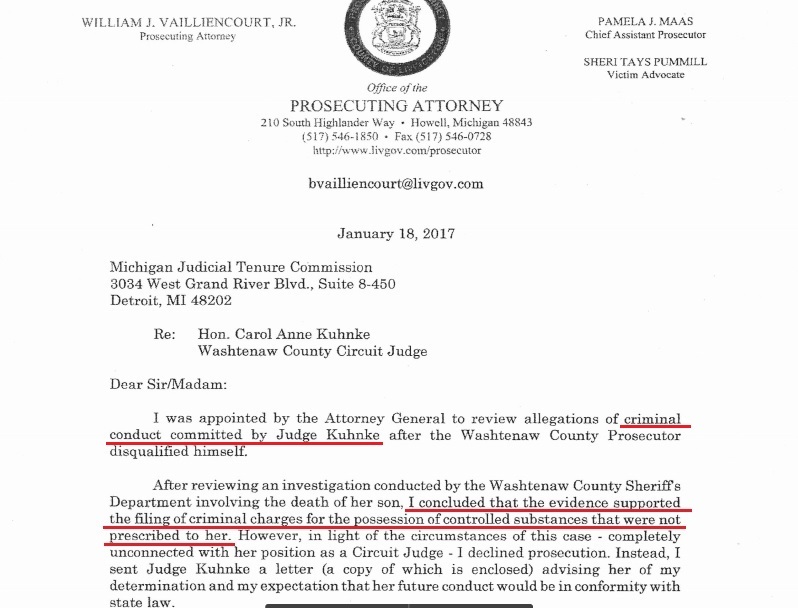 And when it comes to aberrations, Michigan's record is frankly embarrassing: judge Gorcyca jailing kids for refusing to have lunch with their father; Michigan Supreme Court largely siding with Gorcyca; judge felon Kuhnke siding with crooked Pacha under pretext that "Michigan loves employers"; Kuhnke being caught with illegal drugs; same felon Kuhnke endorsing a sexual harasser for judicial reelection; and now Al Pacha posing in the business of fraud prevention. Where does it stop? For a company in the anti-fraud business like QCheque, it just doesn't bode well to have as chief whatever officer someone who commits fraud like Al Pacha.